Now that the first-post-general-introduction is out of the way, here’s a little more about who’s behind the blog, and what to expect from it. ConspiracyPsych is written by myself (Rob), Dan, Mike, and Christopher. We’re all at various stages of earning PhDs in psychology, specifically researching the psychology of conspiracy theories. As far as psychology goes this has been a fairly neglected field of study, producing only a handful of peer-reviewed research papers over the last 4 decades or so. 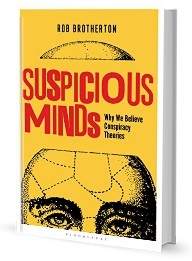 Plenty of work has looked at belief formation more generally but only recently are more psychologists beginning to pay attention to conspiracy theories. The four of us are taking quite different approaches in our research, and will each be blogging about our own ideas and findings. We’ll also be talking about research that has been done in the past, about new research as it’s published, and about ideas for the future. And we’ll be posting more general conspiracy theory-related things of interest as we come across them. Over the next few days and weeks I’ll be putting together a page full of links to other sites, articles, essays, videos, and podcasts from around the internet which discuss the psychology of conspiracy theories, so keep checking back. If there’s anything you think we should discuss or anything you think we should know about leave a comment or drop us an email – you can find contact details, as well as more info about each of us, on the About page. Christopher, Mike, and Dan will introduce themselves in due course. In the meantime here’s a little about my background in conspiracy theories. I’ve been researching belief in conspiracy theories since my undergrad psychology degree at University of Kent. There my final year project looked at conspiracy theories from a social psychological perspective. I moved on to Goldsmiths, University of London, where my MSc project looked at the role of the conjunction fallacy, a common mental shortcut, in making people more susceptible to conspiracy theories. Finally I was awarded funding to study a PhD at Goldsmiths supervised by Professor Chris French. The PhD has encompassed thinking about what the term conspiracy theory means, why conspiracy theories matter, how best to measure belief in conspiracy theories, and the potential role of more mental shortcuts and biases. I’ll be blogging about each of these topics, and more besides, over the coming weeks and months. Hope you enjoy it! I am interested in finding out if you Mr Brotherton, or any of your young colleagues here, have taken the time to investigate the facts and data concerning the conspiracies you call “theories”. Do you have any expertise in such fields as physics, forensics, history, psychological warfare, realpolitik, or the architecture of modern political power? Are you seriously proposing that there are no such thing as conspiracies? What about the RICO Act in the US, and comparable legislation in other nations concerning organized criminal conspiracies? Perhaps to your chagrin, there are indeed proven conspiracies that have taken place throughout history. They are in fact legion. So it would seem to me that focusing exclusively on the idea that it is in some way a ‘psychological problem’ to be concerned with conspiracies is a form of hand waving, and a profound type of academic bias. I am a historical researcher with a forensic perspective, concerned with a systems analysis of modern political power, and the manufactured social structure created by the Public Relations Regime.